The Game Stations Team Building activity contains all of the ingredients for team members to get to know one another and develop good relationships and team cohesion. 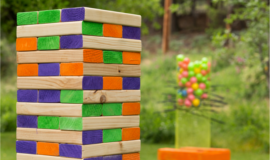 The game stations integrate well with all your events and allow participants to gather around their favourite games (Frisbee challenge, labyrinth, lawn darts, trampoline toss, juggling rings, giant domino…). Games can be provided with or without animation.